The formula does the same fold but is smooth, and conformal on the sphere surface. I have a function which I think is right. It isn't quite the same as from the table, and it isn't minimally conformal in 3d, however it is fully conformal in 2d (on the surface of the sphere or on a plane) and is smooth. then convert the point onto the Riemann sphere, just as is often done with mandelbulb functions. I have a feeling it will make interesting 2d fractals too, but the 3 poles will make it a bit harder to visualise. I updated the formula above to have what should be the correct scale. Looks right now, it turns the unit circle (the equator on the Riemann sphere) into an octahedron on the sphere, as seen by the grey circles. The 0.866 in the formula is more precisely asin(120). 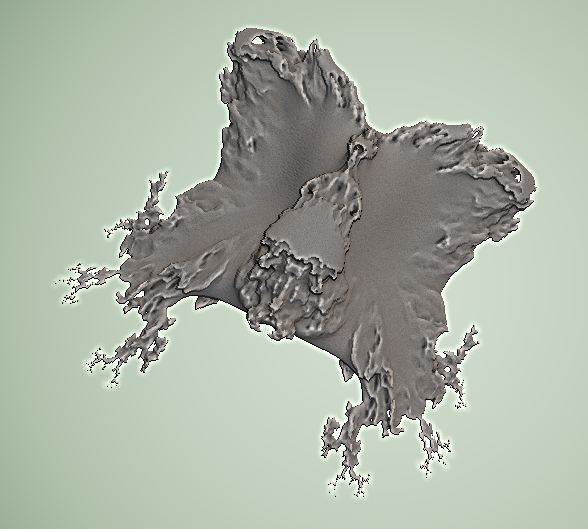 I haven't done anything with the formula yet, apart from try it in 2d, the mandelbrot set of it isn't much use, just lots of scattered blobs... possibly there's a better way to visualise it but not sure... it should produce a 'void sponge'-like fractal I think, like the menger carpet. Ok this is the expansion finally got right!!! I have made the code for you, in fragmentarium (attached). Thanks Syntopia for the rendering without distance estimator, which made this easier to prototype, and thanks DarkBeam for coming back to this one, it is nice to get a continuous function. thank you for the formula, i am typing it into ultrafractal right now, but what is the "i" variable in your formula? the j belongs to the multiplication operatzor, but what is the i from? That's awesome! Just wondering, why not use stereographic projection instead of spherical coordinates? IIRC, the Riemann sphere is obtained from the complex plane (+ point at infinity) by using the inverse stereographic projection. following are images with "itercount=2,3,4"